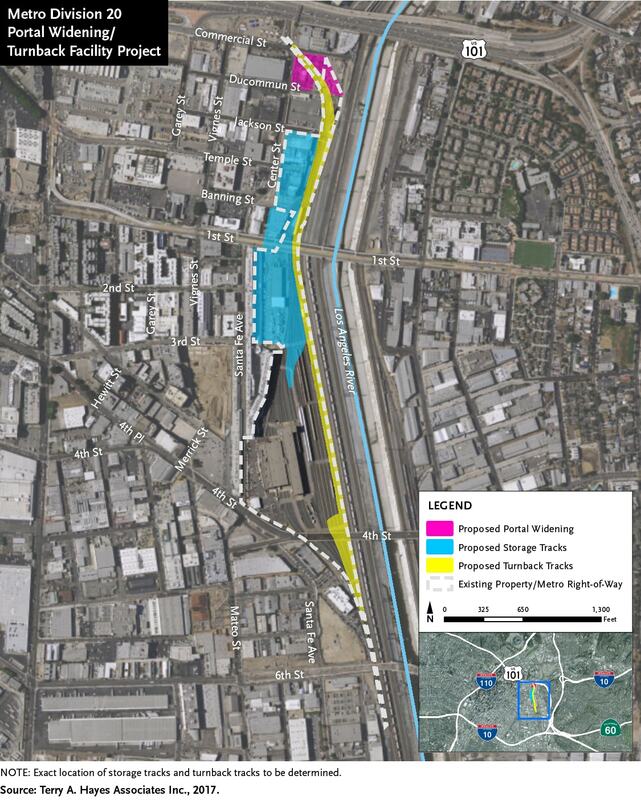 Earlier today Metro released the Notice of Preparation (NOP) for the Division 20 Portal Widening and Turnback Facility project, formerly known as the Red/Purple Line Core Capacity Improvements. The project was environmentally cleared as an Initial Study/ Mitigated Negative Declaration in March 2017. The design team has since been looking at design changes to improve the turnback facility and has determined that the project will be cleared through an Environmental Impact Report (EIR). Two public scoping meetings will be held for the project that will allow Red and Purple Line subway trains to turn around more quickly at Union Station. The project will also make it possible to run more trains on both lines and to create faster headways (time between trains) between Union Station, Wilshire/ Vermont and Civic Center Stations. 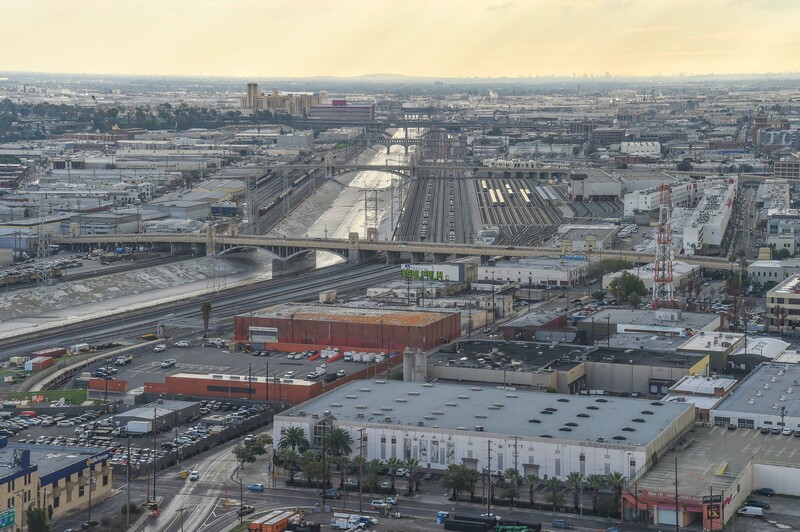 A view of the rail yards for the Red/Purple Line subway and the entrance to the tunnel at bottom left. Photo by Steve Hymon/Metro. The formal name of the project is the Division 20 Portal Widening and Turnback Facility Project. The project is about to enter its formal environmental study phase and the meetings are a chance to learn what will be studied and to suggest any other topics or issues that should be addressed in the project’s Environmental Impact Report. Getting more trains in and out of Union Station more quickly is crucial as the Purple Line is currently being extended to the Miracle Mile, Beverly Hills, Century City and Westwood in the coming years. The first 3.9-mile section to new stations at Wilshire/La Brea, Wilshire/Fairfax and Wilshire/La Cienega is scheduled to open in 2023. The project has two basic components. One is widening the tunnel entrance between Union Station and the Red/Purple Line subway yards in the downtown L.A. Arts District. The other part of the project involves building new tracks in the yard where trains that just dropped of passengers at Union Station could turn around and quickly go back to Union Station. The project is planned to be designed and built in such a way as not to preclude a future Arts District subway station. That project has not been given the go-ahead by the Metro Board, nor does it have funding — although it certainly has been discussed as a possible, separate project for the future. You can read more about that Board report here. How We Roll, Oct. 17: Twitter Tuesday, congestion pricing vs L.A. There is a switch before entering Union station in the station box, I dont understand why that can not be used to speed up trains rather than putting a switch / turn back on the other side of the station? what am I missing here? Some of the subway trains use those switches now to change tracks. That’s why some trains slow down before entering Union Station and after exiting it with passengers. That slows down service — plus it’s no fun for passengers to be on a train that is crawling despite having its own right-of-way in a tunnel. This project would essentially move the switches to the other side of Union Station — so trains can switch tracks after dropping off passengers and before picking them up. That means more trains with passengers can run in and out of Union Station. I have always wondered: does the switch get activated by the train’s motorman or by an outside operator, or is it fully automatic? Same question when a train approaches a wye? Steve, Its more than that. There is already an interlocking east side of Union Station that allows the trains to crossover and back. The project to the Yard and back would be a total different operation to get more trains in service or a lesser headway. Steve, please explain this. Why do the some trains completely stop at the incoming edge of the platform then crawl into the station while not using the switch? Happens on both the red/purple lines coming and going. While some come to a stop, then put the peddle to the metal only to slam on the breaks. Can you say Highland Park Station. It’s part of the automatic train operation/protection system. At the end of the line, the system makes extra super sure the train isn’t going to run off the edge of the platform. Since the Red/Purple Line trains are otherwise mostly automatic, this means the automatic control brings the train to a complete stop and waits for the operator to push a button to signal that everything looks ok. Then the train can pull into the station. Similar stops and slow motion happened at Culver City Station on Expo before Phase 2 was built. At the time, overrunning the platform meant the train was going to fall 100ft onto Venice Blvd. Expo isn’t operated by computer, but does have Automatic Train Protection, which has the power to stop the train if it doesn’t obey certain restrictions. One of those restrictions is a sign before the station that read “Stop and Proceed”. As it is now, a train changing ends (a rail transit term for reversing direction) in the station blocks an arriving train, This project should result in more trains simultaneously changing ends without blocking the station platforms. Thus an arriving train will be able to access the station without having a preceding train blocking access to the station. Also, the east bound platform can now be used for all arriving trains instead of having them cross over upon arrival. This in itself slows down arriving trains even if the west bound (normal departure) platform is clear. This same situation will exist at Metro Center until the Regional Connector is fully operational, As it is now, arriving Blue and Expo trains sometimes have to hold until a departing train exists the station. They need to stop the homeless and the young teenagers that like to start drama, smoke their weed, start fights, and the free riders to stop avoiding fare. I don’t ever ride the subway because of all of this crap! Anything that improves the current headways on the red/purple line is good news. It’s embarrassing how much time we have to wait between trains. In most major cities, if you miss one train, you only have wait between 3-6 minutes before another one arrives. Sometimes less, but I’m not expecting metro to morph into the London Underground anytime soon. 20 minutes on the branches in the later evening and on Sunday, but better in the early evening and on Saturday. At peak in the BART system core from West Oakland to Daly City, it’s about every 3 minutes. And BART is upgrading the signal system to allow more trains through. Platform capacity at the stations in the San Francisco Financial District is getting to be the constraint, which would require some very expensive fixes.